This game can be placed in cut the rope games series, but this time it is improved by diversity and by the fact that frogs come from all over the world and not to forgot that you can be easily included in different mystical land. It can be framed also in strategic games because you have to use your skills to estimate the ideal cut for these little frogs. Take your time and don't forget to think more than once if you want to make the big cut to achieve the maximum score. Meantime, be careful to take all the stars if you can just this way you're about to reach next level with the perfect score. Be patient and ambitious because you are about to fail at first but then you'll be fascinated by the strategy you'll adopt when you are put in difficult positions. 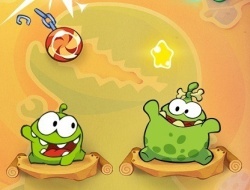 Cut the Rope Time Travel 10.00 between 0 and 10 based on 1 votes.